At the Law Office of Ben Crittenden in Anchorage, Alaska, we are fully prepared to defend your rights and interests while fighting to help you achieve the favorable outcomes you seek for the serious and complex legal challenges affecting your life, your livelihood, your freedom and your future. Recognized for his professionalism and service, Mr. Crittenden has earned several awards and honors throughout his career, and Expertise LLC voted him among the Best Car Accident Attorneys in Anchorage in 2017. This level of success comes from our unwavering commitment to those we serve. We promise to do all we can to assist and support you during your difficult and uncertain time as we aggressively pursue the positive results you expect and deserve. Along with recovering substantial settlements and awards for our plaintiff injury clients, we have helped numerous individuals fight the charges against them in order to preserve their freedom. Mr. Crittenden is a graduate of the National Criminal Defense College, and he is heavily involved with the Alaska Association of Criminal Defense Lawyers and several other professional legal organizations devoted to criminal defense and trial advocacy. 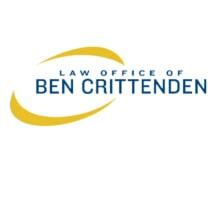 For more information on how the Law Office of Ben Crittenden can best serve you or a loved one and help you secure a brighter future for yourself and your family, you can contact us by phone or through our law firm's website to schedule a free initial consultation.